Hermes is a German courier company with headquarters in Hamburg and major operations in the UK. The name comes from the Greek god of trade. Hermes also operates myHermes and Hermes ParcelShops for businesses and their customers to send, receive, and return packages. The company delivers parcels for many online retailers, including ASOS, Topshop, Next, Amazon, John Lewis, Asda, and more. Hermes couriers are self-employed which has drawn criticism for the brand due to their treatment of “gig economy” workers. Customers frequently complain about Hermes deliveries, including delays and damage. This is how you can contact them regarding late delivery. 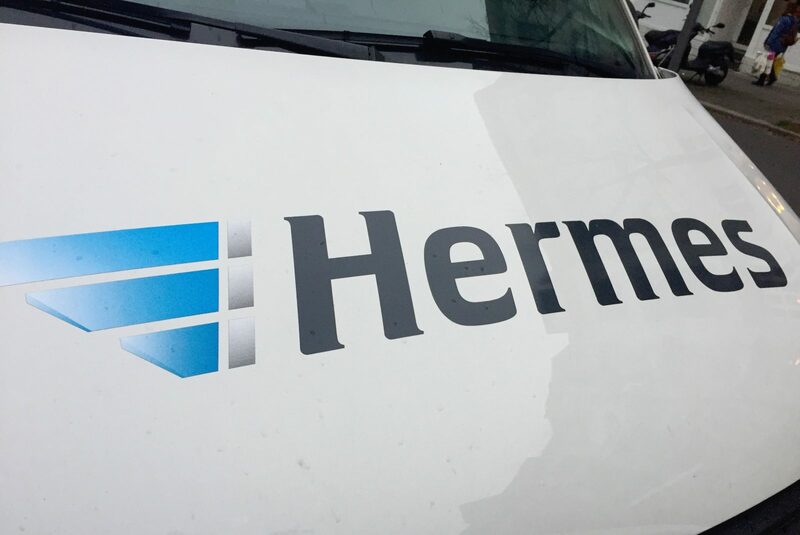 If your delivery is late, contact Hermes on 0843 816 6824 to find out where your parcel is. You should have received an e-mail with the tracking information and link. Clicking on this will show you the status of your Hermes delivery. It gives you step-by-step updates with time stamps. 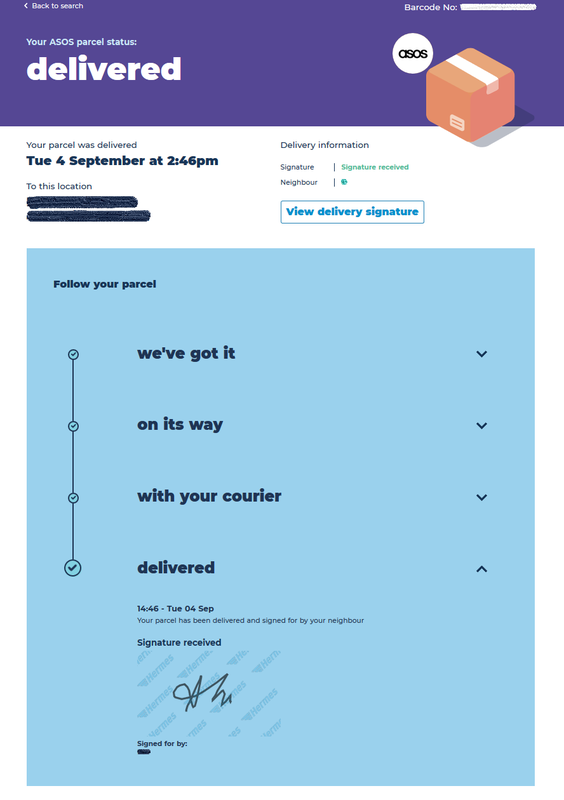 It tells you when Hermes gets the parcel from the sender, when it arrives at their depot, and when it is with the courier and out for delivery. You will need to give Hermes your 16-digit tracking reference or barcode number when you call. They will have access to more tracking details than you on the other side. They should be able to look into issues for you from 8am to 8pm during the week or 6pm on weekends. In some cases, Hermes might tell you that the problem is with the sender. Therefore, you must contact the seller or online retailer you purchased these goods from. In the case of lost items, it is them who will have to reimburse you and not Hermes. However, if Hermes does have your parcel somewhere, they do have a responsibility to locate this and try to get it to you. Or if one of their couriers has caused loss or damage, you should be able to complain about it. With missing parcels, you should confirm the tracking information with Hermes then call the sender to dispute it. 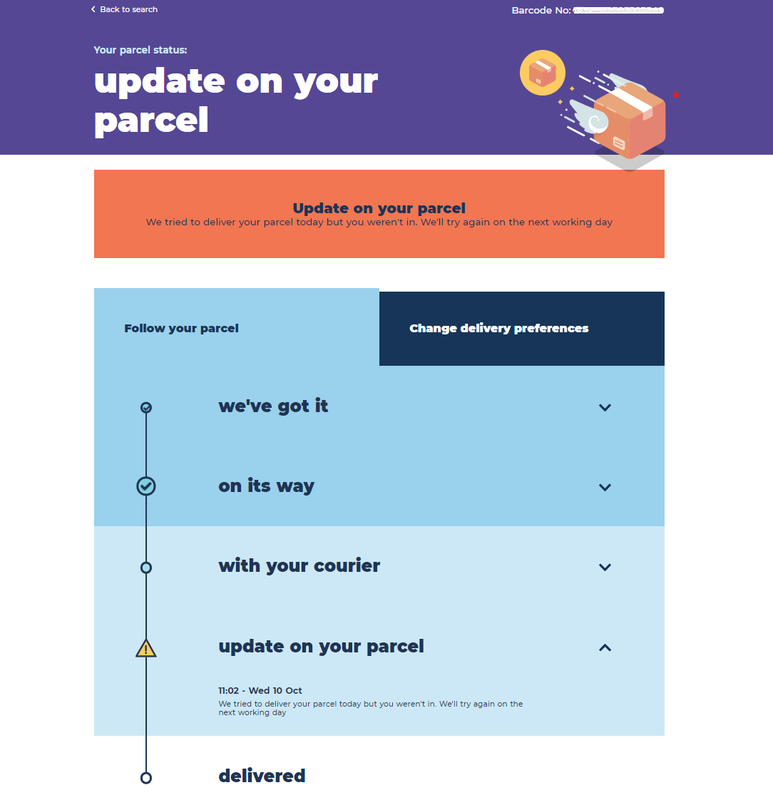 If Hermes have the parcel but aren’t delivering yet, Hermes can assign it to a courier faster or contact your courier for you to see where they are and when they will be at your address. You can get help rearranging delivery for later. As mentioned, before you call customer services on 0843 816 6824, you should get the tracking number from your e-mail and enter it into the Hermes parcel tracker. This will show the latest information that Hermes holds on your parcel. If it says delivered, it should tell you to which address and provide an image of the signature. This way you can dispute it if you don’t recognize the signature or the parcel is not in the place it was supposedly left in. If your parcel is missing in such a case, read our guide on Hermes missing parcels instead. Keep reading this guide for what to do about Hermes deliveries which are on the way but taking too long. For example, their tracking status might be stuck at a certain point if they didn’t update it within the last day or if they didn’t even attempt to deliver. Another issue with the online tracking may be that they claim to have attempted delivery, but you missed it. This will make your delivery late as you will have to wait for them to try again the next working day. If it is a Saturday, they will not attempt redelivery until Monday. If this causes problems for you, then contact Hermes to see if the courier can try to deliver that same day. Hermes couriers deliver between 8am and 8pm from Monday to Friday. They deliver from 8am to 6pm on Saturdays, but not on Sundays unless the retailer pays for Sunday deliveries. If your delivery is going to be late and you know you won’t be at home to sign for it, go onto the tracker to amend it. Click on the “Change delivery preferences” tab and you can update the delivery instructions. If you leave it on “no special preference” the courier may not leave your parcel. You can set a safe place for them to hide your parcel until you get home. This could be in a porch or outbuilding, or they could leave it with reception if the building has one. 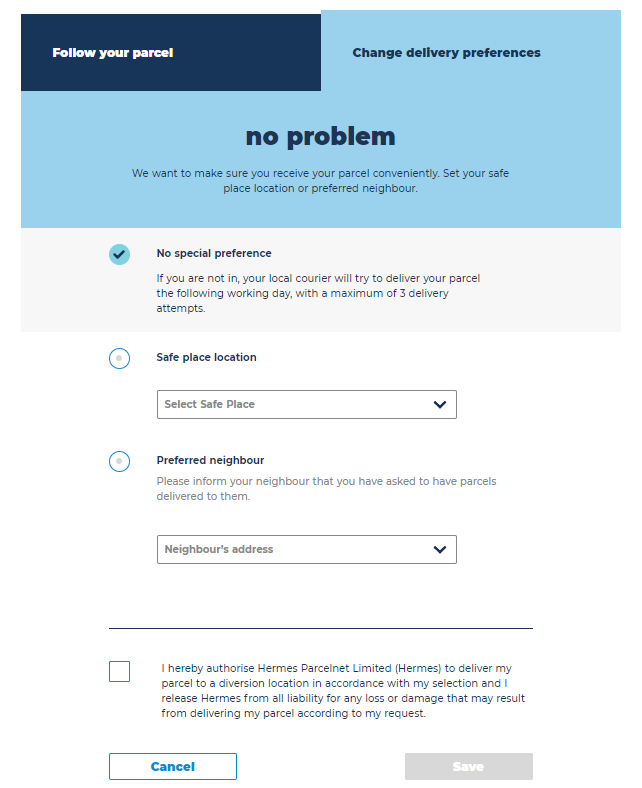 Otherwise, you can select a neighbour from the list of nearby addresses for them to leave your package with. The neighbour will have to be at home to sign for it, and you should probably ask them first. You can collect it later. Notice that when you tick the box to save your selection, you are releasing Hermes from responsibility if anything goes wrong as a result of them following your instructions. Remember that you should allow 3 working days for the parcel to go through Hermes’ delivery system. If you paid for express delivery and Hermes is the courier, you should complain about late delivery to the retailer, as they’re liable for giving refunds. Hermes will not offer compensation.